Indie spotlight focusses on self-published authors and self-publishing. Here, in the first of today’s Indie spotlight dual edition, Christie Dao, a Vietnamese-American now based in Singapore, explains how she came to publish her inspirational book, Actualize Your Dreams, and why it was important for her to work with an Asian-American editor. Christie Dao was born in Vietnam and moved to the United States as a 12-year-old. After graduating high school and gaining a full-tuition scholarship, Christie finished her bachelor’s degree one year ahead of schedule. After earning her master's degree, she relocated to Singapore as an employee of Intel Asia Pacific. She has lived and worked in Singapore for the last 18 years. Actualize Your Dreams: from wishful thinking to reality is Christie’s self-portrait of growing up in an Asian household in the United States. It charts her determination to achieve and obtain her personal education and career goals from her teenage years until today. Learning English and the cultural norms Americans take for granted were just two of the stumbling blocks she encountered as a new immigrant to America. But she overcame the barriers, and her life came full-circle when her career brought her back to Asia, the continent she left as a 12-year-old. I had an idea of writing this book about 20 years ago, so I've been collecting data points and keeping a journal. The writing process took nine months. Before this, I didn’t know what being an indie meant or what developmental editing was. I just knew I had a story to tell, and I owed it to myself and my grandparents to write this book. Being an unknown author, the thought of reaching a top 100 list was an impossible dream. To my pleasant surprise, I was able to reach Amazon #1 Bestseller in two categories and #2 in a third category. Here is my story on self-publishing a book about Asia, from Singapore, for an international audience. 1. Narrow down to ONE big idea for the book and make it a page-turner. 2. Identify your primary audience so you can rally their interest from beginning to end. 3. Finding an editor who is most suited for your project. As a new author, it’s important to see what others have done in your genre to stay away from the extreme. Check out author Joanna Penn’s YouTube channel and find the right balance for you. Tip #1: Having a page-turner is important in two ways—readers will benefit from your hard work and they will likely leave a customer review on Amazon, which boosts your book's ranking. The biggest first-draft challenge was to develop a structure that linked my content to one big idea: the title of my book. White boarding or outlining helps. You may find that sometimes you get too excited about a piece of content, and you jump in and write. This is likely to bite you in the behind during the rewriting process. Personally, it was easier to self-publish than to launch a 2-person helpdesk to support M&A customers, my first project after landing here in 2000. I didn’t suffer time-zone fatigue publishing this book. I felt helpless without proper guidance in 2000. Today, if a response delay occurs, I jump online to pick up new ideas. Tip #2: Get other people’s perspectives on the subject so your book is more balanced. My primary audience is young adults. My goal was to keep the content short and filled with practical advice that they can adopt. I spoke to young adults to understand their current standpoints. I went back to the US to get my family’s views on how I have changed over the years. An old photo album was a great reference point to recall key milestones. Before I knew it, my first draft was done. It was a huge achievement compared to any big project in college or at work. To my surprise, the most intense period was in the rewriting. After getting developmental editing feedback, which focuses on organization, pacing, and structure, I was really stressed for about three weeks as I shifted content around and came up with a better writing structure. I lost count of how many times I revised certain parts to get to the clarity level that I was happy with. When I got stuck, I went online again. At Lyndia.com, I found Lisa Cron’s training helpful in restructuring to a better flow. Tip #3: Find an editor who is well suited to your project. I knew having an Asian-American editor would be important for me and my project. This type of editor would be more likely to understand my struggles and could suggest ways to tell my story in a better light. There weren’t many Asian American editors in my search, but Crystal Watanabe from Pikko’s House really stood out to me. I waited two months for her calendar to clear up to support me on developmental editing and line editing. Crystal has a way of giving feedback that is so gentle yet awakening. I spent two months full time on rewriting, getting early reviews so I knew the content was accessible for an international audience. It was all worth it! Out of the nine months, the last three were very busy. After rewriting, I spent the last month on book marketing, which is not my strength. I’ve done a lot of research and did what I felt was right for me and my book. To keep the cost low, I did many things on my own and am blessed to have the support of my international contacts for quick input. I looked on Fiverr to help with the book cover, layout, banner, and press release, and to Pikko’s House for editing. I was amazed with the outcome. After seeing my book reach 79th place on Amazon's ranking on its second day after publication, I set a goal to be in the top 10 a week after launch. To my pleasant surprise, I was able to become a #1 Bestseller in the next two days. The credit for this goes to book cover design, a powerful subtitle, from wishful thinking to reality, suggested by my friend Robert, inspiring editing suggestions by my editor Crystal, and amazing input by international supporters. As Lao Tzu put it: A thousand-mile journey starts with a first step. Take the first step! Things will get easier. You will look back and be proud that you have written a book like I did. Some say having a book published is your new business card. I concur. Many pleasant surprises occurred after my book launch. I am very grateful for the level of support I have received. 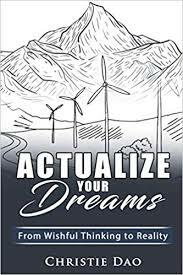 Details: Actualize Your Dreams is available from Amazon in paperback and Kindle formats.